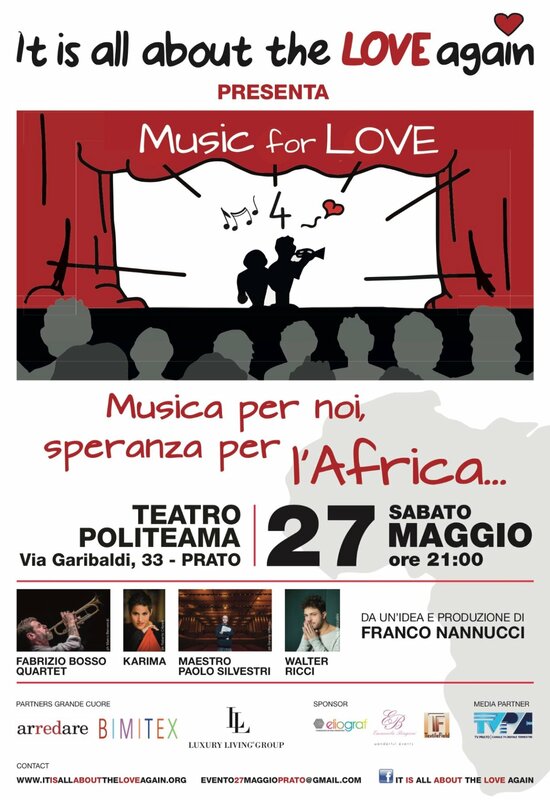 The musical show "Music for Love" is an event created and produced by Franco Nannucci, for the first time in 2016 and has evolved into its present format on the Prima at the Teatro Politeama Pratese in Prato, Italy on May 27th 2017. The format follows synergies within music and images, used as a vehicle to promote awareness about charity projects in several countries and to support people in need that live on the boarder between life and death. It is also one of the opportunities of promoting the yearly event, produced in Italy, linked to the fundraising campaign to support the projects of the “Fondazione Fabrizio Meoni Onlus” and “Il Tesoro nel Campo”, www.fondazionefabriziomeoni.it. With a roster of internationally recognized artists we are guaranteed great musical performances and a unique experience. On top of this the future evolution of the event, is to combine local special guests at every event, in Italy or internationally to blend different cultures and different musical heritages together to demonstrate that when great artists and musicians are together on the scene for such an event, something magical happens. This will allow us to have a unique show / event at every single performance too. Music used as a giant speaker to spread a message, Music of every kind and origin together for the same cause. The music program was selected especially for this event by Franco Nannucci with Fabrizio Bosso, Paolo Silvestri and Giovanna Mascietti. Paolo Silvestri wrote all musical arrangements for the songs performed by strings's ensemble, voices and guest together. There is an existing extension of the music program that will suit the needs of an international audience versus an Italian one.